Friday the 25th of July the people of Ni’lin gathered once more to protest against the construction of the apartheid wall. 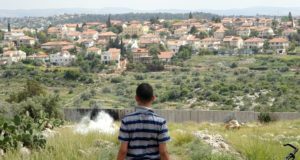 About 150 villagers and about 20 internationals and Israelis could be found at the olive field overlooking the scar in the land, which is formed by the bulldozers, as a beginning of the wall. The demonstration began with the Friday-prayer. After the praying most of the gathered people went down to the bulldozed road to put stones and branches on it, so that it became blocked. The roadblocks took up a distance of about 200 meters. 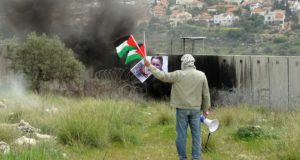 The aim of the action was to delay the bulldozers and the Israeli army vehicles which drive on the road, so that the work with the wall have to wait for the road to be cleared. The spirit of the demonstrators was high, there was singing, shouting, whistling, laughing and chanting. Big as well as small rocks efficiently blocked the road. The action kept on for about one hour. 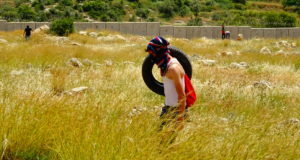 After the action some villagers went up to the checkpoint next to the road which divides Ni’lin in two. The Israeli army shot teargas-canisters at the crowd. The turbulence kept on for about one and a half hour. The checkpoint was then blocked for a couple of hours after the protests, which made it very difficult or impossible for the villagers and others to get in and out from Ni’lin.